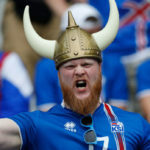 The Friday File: The smallest nation to ever qualify for the World Cup is Iceland, which, with a population of 335,000, will play in 2018. Prior to Iceland, the smallest nation to contend was Trinidad and Tobago, which competed in 2006 and has a population of 1.37 million. Before them, Northern Ireland held the record. They first qualified in 1958, with a population of 1.85 million. Go Vatican; population 801.